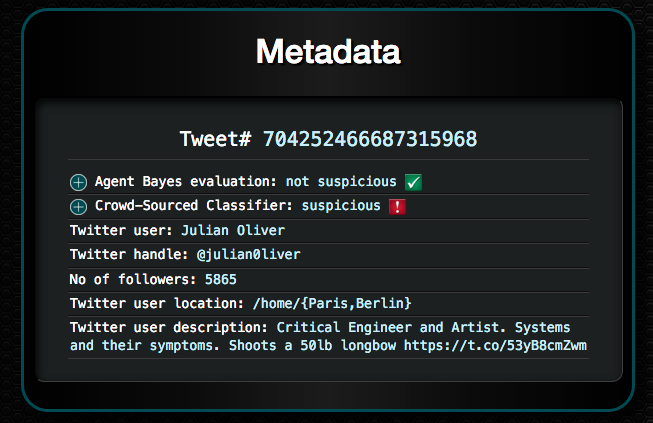 The metadata for each targeted post contains evaluations from multiple machine learning classifiers. Make your decision based on the available information and your best judgment. Intelligence agencies err on the side of caution – their goal is to share all the data, and find the needle in the haystack. Posts referencing people or groups who are known targets (e.g., Edward Snowden, Julian Assange, Anonymous) would warrant close scrutiny by an agent. Intelligence agencies are opposed to the use of encryption, intelligence leaks, open access to information, and other activities that could cost them their informational advantage. Posts that are supportive of these subjects would be scrutinized. Sarcasm, parody, or references tend to not be recognized by intelligence agents. Feedback provided will be used to improve the performance of the machine learning classifiers. Select a target from the Self as Actor: Colonizing Identity Watchlist or view all targeted posts. 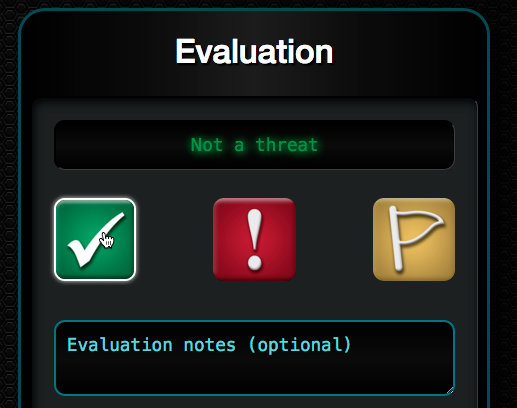 Your job is to evaluate Twitter posts according to their threat to national security and/or individuals. Select a Twitter handle below to view recent posts by that user. You may also choose to see tweets by all users. You will be directed to a list of recent posts. Choose a tweet to review.